Pat and Ed are in mourning, so they head for a familiar haunt to sink a few more beers and throw some arrows in memory of the fallen, Simon. In the dingy lounge bar of a decrepit pub, where the décor is as out of date as the power ballads on the jukebox, the pair play darts, reminisce and mull over their run-down lives. 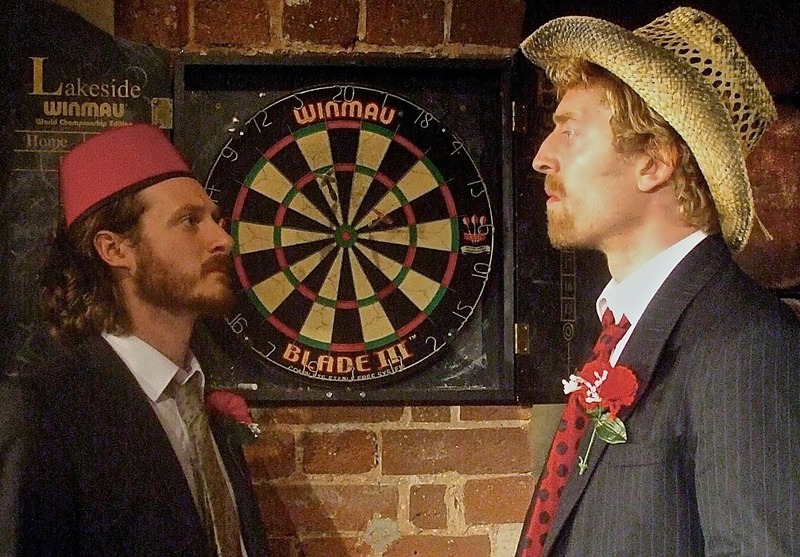 Gradually, stealthily, and with creeping unease, the rituals of this male-oriented space – the pints, the darts, the hats – are appropriated by newcomer Sarah, who then moves on to the rituals of male friendship and the arena that supports them and shakes them up in ways Pat and Ed could not have believed possible. To be too explicit about the plot of Mugs Arrows would pepper this review with spoilers, which would be a real shame, because one of the twisted pleasures of this deliciously constructed piece is the reveal early on that pulls the beer-stained rug from under you and forces you to reconsider what’s gone before, while simultaneously going straight to the heart of what makes these characters tick. Just as the opening sequence uses a spotlight to pick out the details of this male space – the pint mugs, the darts, the trilby hanging on a wall peg – so the narrative shines its torch on the motifs of the male relationship, peering into the darkest corners to see what’s lurking there. As Sarah’s presence picks at Pat and Ed’s friendship, and the myriad failures and disappointments begin to stack up like so many dead sheep – “their little black faces in the snow, all dead” – then the real demons come slithering out. A dodgy bladder, a tendency toward panic attacks… these become the least of their worries. And while the dark humour keeps us laughing, and the steadily unfolding narrative – exquisitely paced by director Ken McClymont – tightens its grip, so we are pulled deeper into the recesses of the psyche, where all those desires, resentments and fears lie hidden, festering, primed to add their stain to the already blackened wallpaper. Well, here is Sarah with her bucket of blue paint to tackle the rot. Who does she think she is? Exactly who Sarah is builds to a scene of such brilliantly bonkers surreality that you’ll be agog. Just as the grimmest, most effective fairy stories reflect our primal fears, so Sarah becomes Pat and Ed’s worst nightmare. Twisted through the prism of their vulnerability, loneliness and self-denial, what she represents – change, disruption to their routines, progress – turns her into their very own demon. With a script rich in subtlety and subtext, so the performances draw out the nuances of every glance, every word, with masterly timing. Elks (Ed) and King (Pat) perfectly capture the paradox of male friendship: the unstintingly loyalty undercut by cruel-edged one-upmanship; failed relationships, careers and reputations forgotten until a barbed reminder calls forth the shame. There’s tenderness here, too, and a recognition that each is sanctioning the other’s stagnation. As the harbinger of change, Polly Hughes conjures Sarah as a force of nature, channelling and focussing the sinister undercurrent seeping up from below. Mugs Arrows began life in Exeter last year, during Third Man’s residency here with the wonderful Botallack O’Clock. During this run, the company will also be starting work on a new piece, Skylark, the early stages of which will be revealed in scratch performances. I can’t wait to see what they come up with next.